If you read my last post you'd know that I've been getting bored with my regular commuting route and have been looking for ways to spice it up a little. Commuting, for me, is about getting to and from work in the shortest time possible, safely of course. In the mornings I walk my daughter to school before jumping on the bicycle and cycling to work, arriving with just enough time to change and freshen up before the workday starts. In the evening there is 10km of road between me and my family that I want to cover as fast as I can so I can be with them in time for dinner. While changing my well worn route will add some variety to my ride, it will also add time to my commute and doesn't sit well with me. This morning however, just by chance I discovered another way to add some variety to my ride which should have been blindingly obvious. I rode a different bicycle. My usual commuter is a Giant MCM One small, light, fast and fitted with narrow slick tyres. 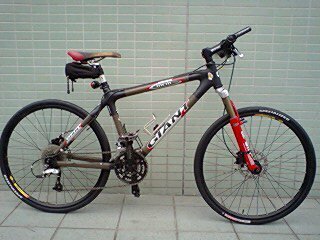 Its a tough mountain bike that I used to race in the past, but over time its been modified become a speedy commuter bike. Well, the Giant is in need of a new front brake disc, and some pads. In such need that its actually become dangerous to ride. So this morning I brushed the grime off the Cannondale F300 MTB that my wife rescued from the pound (Suginami Green Cycle). It has a larger frame, wider handlebars, a rack and big bouncy mountain bike tyres which made for a much different feel to the ride to work this morning. With three bikes in my stable I really should take the opportunity to use each of them on my daily commute. They're not all "commuters" but they all do the job. By changing bicycles occasionally I can spice up my commute without having to change route nor add excessive amounts of time to my journey. I use a VanMoof fixie, a 70 year old steel monster Kronan and a new Panther TLite 777 ebike to commute/commune around Sydney - they all need different styles of riding feel very different and keep me fresh. Nice bike. It is always a fun experience when i ride my bikes having to see nice views as you go with your bike trips.